The patriarchy impacts our spiritual growth and journeys in so many ways. Lack of equal pay. Sexual harassment. Exclusion from political and leadership positions. Death by male generated violence. All continue throughout the world on a daily basis and are of course even greater for women of colour and the intersecting oppressions they live with that white women do not. Something that has become increasingly of interest to me of late is the very personal impact the patriarchy has on our thinking, belief systems, and how we show up in the world every day. The internalised oppression we carry and the impact this also has on others, especially when we remain unaware of its impact – and even wounding. 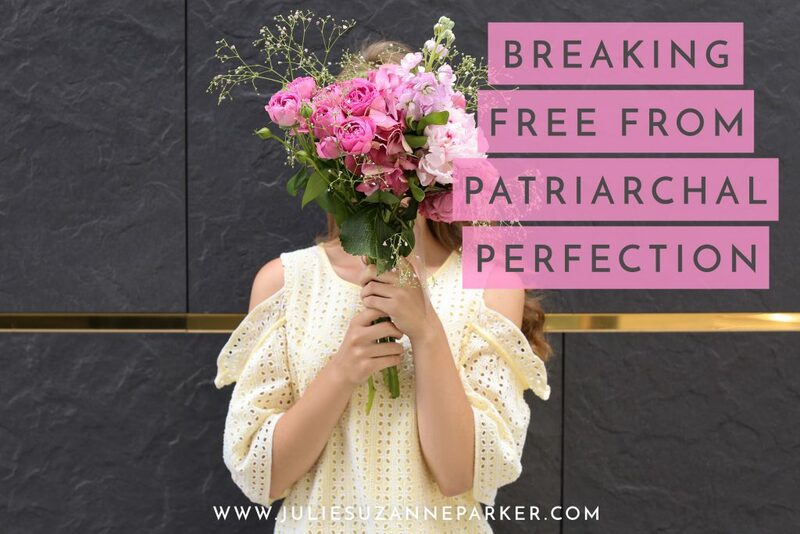 Even though the patriarchy impacts people of all genders, one of the areas I see play out between women in particular is that of perfectionism. Patriarchal ideals instil in women that we must be beyond exemplary, together all the time, clean, pristine and free from blemish, mistake or failure. We must be small, petite, contained, calm. A picture of homeliness and even holiness. We must be perfect. Anything outside of this means we are messy, wobbly, angry, fierce, different, dirty and in need of containment. Such things make us wholly unacceptable to a societal order where men are to remain dominant, in control, and holding unchallenged power. Messy, wobbly, angry, fierce, different and dirty women are a threat. You may see yourself here. I know I certainly have in some and to certain extents still do. The power of a societal oppressor is mighty strong, and I don’t think any of us are immune to its impact. So many women I know through my work and personal life are gripping on to the entirely unattainable desire to be perfect, or at the very least mistake free and criticism free too. We twist ourselves into knots to make ourselves and everything we do in our lives, careers and businesses perfect. We hold back from doing things for fear we will be criticised – or that it won’t work anyway. We do things half-baked so we can minimise the chances of it failing – whatever that may mean. When we do make a mistake we deny we’ve done so and become defensive and/or pack up and go home – wounded and defeated never to try that, or sometimes even anything, again. We catastrophise if one even small thing we put our hand to does not work, taking that to mean everything we have done is a failure and even we are a failure with it. The impact on our own lives of such oppressive behaviour is pretty clear. We lack compassion for ourselves. We hold ourselves to unattainable ideals. We become our own worst enemies. Our egos run rampant while our soul longs to speak to us with kind words of love reminding us that no one is perfect, we are all flawed, fears are normal, criticism only has power if we give it so, mistakes can be amazing learning tools, and that being messy can be illuminating and life affirming. What is also important here (but much less spoken about) in our own pursuit of perfectionism is how we then project this internalised oppression onto other people. Especially other women. The snarky correction of spelling and grammar. Like, really snarky. No love, and a total failure of appreciating that when doing things like typing on a phone, an error can be made inadvertently in an instant. Judging a mother for everything from how much time she chooses to work, to what she feeds her children. Getting annoyed and even angry when someone we follow on social media is in promotion or launch mode and thinking they are taking up too much space or big-noting themselves. So often these things are done because of our own internalised oppression. And are more of a result of how we feel about ourselves than anything else. We are stringent to the point of punishment with ourselves about not making any mistakes, and so everyone else will be held to task about it too. We dislike our bodies, and so can instantly see ‘problems’ in the way other women look and dress. We are so fearful of whether or not we are a ‘good’ mother we instantly see/create ‘bad’ in others. We have a fear around being seen, taking up too much space or being criticised, and so when we see other women breaking free of this, our fears are amplified rather than us being inspired. And all of these things contribute to us making dangerous assumptions, gossiping, closing down communication and so much more. I am sure like me you have likely been on the receiving end of some of the things I mention here as well as you likely, like me, having done some yourself as well. This makes you nothing more than beautifully human and flawed. And being a woman who is, still in the 21st century, living under a cloud of patriarchal oppression. My heartfelt call to you is if you do know yourself to be someone who is railed by a perfectionistic nature, to not blame yourself for that given the systemic oppression we know is impacting us all, but at the same time recognising that it is your responsibility to look compassionately and gently within at how you can better respond. And further to that to look at how your perfectionism may be being projected onto others in ways that are harmful and hurtful that you may not even realise. The heart of this for me as a practising priestess and someone who is undoubtedly flawed, messy and walking a path to continual wholeness? We need to give each other a break. We need to allow each other to make mistakes and be there to lend a hand or at the very least not judge when we do. We need to work on our judgement of self and therefore others. We need to know we are all influenced by the patriarchy and doing our best. We need to cut each other some slack. Above all else, we need truly think about what we are really saying about ourselves every time we criticise another woman or try to hold her back or down. Or at the very least recognise when we are doing that and not be in denial about it. What is it about us when we do such things that means there is something within us that is crying for our own love and attention? Love and attention that a patriarchal society will never give us but is always within our power to reclaim and give ourselves. Do you see yourself here in some of these patterns and behaviours? How are you awakening or have become awakened to the ways the patriarchy influences you – and in turn maybe then how you treat others as well? Thank you so much for this powerful post! I hope recovery is going well. There is so much goodness here, so much to spark conversation and inspire to do things differently. I agree with you that the patriarchy is putting so much pressure on women (and everyone else not sitting on the white throne of power). I coach a lot of talented women who are extremely hard on themselves (and other women). Through this work I’ve come to believe too that oppression lies at the source of this relentless pursuit of perfection. As if we’re all collectively trying to do something so well that eventually we’ll be “good enough”. That nobody will criticize us anymore. Because that criticism to me is such a powerful tool for the oppressor to keep us doing what we’re doing… while we’re doing our best to live up to our perfectionist ideals, forcing other women to do the same, the status quo stays intact. Nothing changes. I’ve chosen “Liberation” as my word of the year for 2019. Getting free of perfectionism, and giving myself – and other women – a break is on the agenda. Nothing then changes indeed Murielle. There is so much here for us to unpack in relation to the patriarchy and how it is influencing us but then in turn I really hope we have the courage to look at how WE then go on to impact others. Because that is the part here I feel is somewhat of a missing link right now. I know you will have seen this as many of us have – but the way that women treat other women sometimes is both saddening and maddening. And we’ve got to stop. Looking at how the patriarchy co-opts us into doing their work to behave this way is I feel a big part of this liberation you speak of. May 2019 be amazing for you!